How do you even start reviewing one of the most popular shows in history? This is my favorite Jim prank. Tom and I just finished the final season this last weekend. We have diligently watched each season. We got behind the last two years because of Tom joining the Army. While he was at basic and deployment our favorite show went on the shelf until his return. And now we have seen them all! 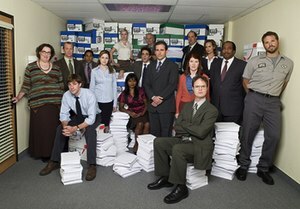 The Office ran from 2005 until 2013. It is based off the British version, just with an American twist. It was a show about regional office of a paper company. The entire series was based on the fact that there was a documentary crew that followed the employees around. They just filmed real life. It showed a 9-5 job and how relationships grow or don’t grow over time in the workspace. It displayed the quirkiness of real people and how they get through each day at jobs they don’t necessarily like. Except Dwight, he loves paper. It is one of the few shows that cares about the fans, and they ended the show perfectly. You know how you watch season finales and there isn’t any clarity or they leave loose ends? Or you just hate that you spent all this time watching a show for an awful ending…ah hem Lost? Well The Office wrapped everything up nicely so there wasn’t any question where the story lines were going. It was a sweet ending to a marvelous show. Tom and met in 2007 after the show had been on the air for a couple years. At that time, I was still against watching it and put my foot down in protest for a hot second. But, Tom is pretty persistent for those of you who haven’t met him. Plus you know when you first start dating someone, and you are willing to try new things that interest that person? Well that was me. He loved the show and eventually convinced me to watch from the beginning. After the first season, I was hooked. When you watch consecutively, you fall in love with the characters and are invested. You want to know when Jim and Pam will get together, which they drag you along for several seasons. You want to find out about Dwight and Angela’s secret love affair. You want to know if Dwight ever graduates from being the Assistant to the Regional Manager. The show is super funny. I don’t know what I was thinking before…denial I guess. Let’s be honest, I was probably being too uptight about it. The good news is I obviously came around. Jim’s pranks are my favorite. He doesn’t really work; he just tries to find ways to mess with Dwight. He was so creative! Tom’s favorites are the jello calculator and when Jim bought hundreds of feet of red wire and strung it around the office and surrounding areas. This show meant a lot to us and our relationship. This show really helped us through our long distance while at Clemson and Iowa State. We would wait to watch it together when we were reunited for weekends. We would hole ourselves up and watch hours of it at a time, which is really the best way to watch any series. And each year before a new season would come out, we would re-watch the entire series. It’s hard to explain the greatness that is The Office. They really did a wonderful job casting. I look at people they auditioned, and I just can’t picture anyone but those picked. Wonderful compilation of people. The only season I wasn’t fond of was season 8, and mostly because we hated Nellie and Robert California. I think they could have done better. But maybe they were just setting us up for the end and to be pleasantly surprised. I cried during the last three episodes. The last episode of the series Tom and I were both crying. I was bawling really. I just felt so connected. When you are with a series this long, it’s like you live in this world. These characters become a part of your life, and they are your friends. I had to say goodbye forever to these characters. There is not an episode of this show that I haven’t seen. That was a hard pill to swallow to know that I wouldn’t see them anymore. If you haven’t given this show a chance, I promise watch from the beginning and give it a chance. I am so glad that I did! Come back on Sunday for “Autumn on My Mind.” Sunday’s episode is about fall food and sharing recipes. You can see the full schedule here. This entry was posted in Book Club and tagged Dwight pranks, Jim and Pam, long distance woes, review, the office, tv. Bookmark the permalink.